You're clearly not tired of zombies, are you? How could you be? They're the perfect surrogate for people in violent video games. Without worrying about any of the moral consequences, you can shoot, chainsaw, maim, electrify, incinerate, or nominate them for Oscars! Try doing that with a normal human being! 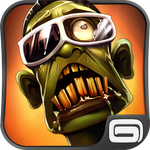 In Zombiewood, the carnage takes place in a Hollywood (get it?) backlot, the one place you've always wanted to let loose and break stuff.